(Newser) – Several avid northern lights watchers who call themselves Alberta Aurora Chasers on Facebook were sharing photographs at a talk when a professor at the University of Calgary noticed something strange. The citizen scientists were referring to a purple streak of light as a "proton arc," but no proton auroras are actually visible. Intrigued, Prof. Eric Donovan looked into the matter and, looping in other scientists, realized they were observing a previously undescribed night light, reports the BBC. 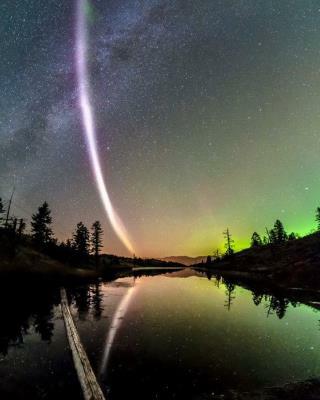 The group of amateurs took to calling the light "Steve," with one joking that it's more than just a nice name but possibly also an acronym for Sudden Thermal Emission from Velocity Enhancement. Something vented by the "Space Plane" before it came down? Or to put it in layman's terms space alien contrail. The exhaust gases emitted from a plasma engine in earth's atmosphere. Many discovery have been made my amateurs over the years this is even more true when it comes to astronomy.